Hazard communication is one of the most important occupational safety standards as it ensures employees are made aware of the potentially hazardous chemicals and risks to which they may be exposed. With the extreme importance placed on hazard communication, understanding the changes associated with the harmonization of the United Nations' "Globally Harmonized System (GHS) of Classification and Labeling of Chemicals" is critical. OSHA's Hazard Communication Regulation (1910.1200) was initially developed in 1983 with the goal of providing employees with the "right to know" of the hazards of chemicals that they were working around. This regulation accomplished this by mandating that all chemical hazard labels be applied to chemical containers. In addition, Material Safety Data Sheets (MSDS) needed to be supplied for each chemical, and be accessible to employees. Employees also needed to be trained on how to identify hazards and how to work around the chemicals. Almost every country around the globe has guidelines or regulations with similar objectives to OSHA's hazard communication regulation: To warn employees or anyone coming into contact with the chemical about the hazards present. However, every country had a different way of not only categorizing hazards, but the classification process and how the hazards were depicted. Many changes were made to the hazard communication standard, but there are a few key changes that are greatly affecting the way facilities will manage their labeling process. Every chemical in the United States (there are approximately 880,000 different hazardous chemicals used in the US) needs to be re-classified by the chemical manufacturer per the GHS standard. This re-classification helps with the United Nation’s goal of streamlining chemical hazards globally. The MSDS is now referred to as a Safety Data Sheet (SDS) and has a new format. The new SDS has 16 specified sections to help streamline the information provided, in addition to making it faster and easier for employees to find the information they need. These new SDS's will need to be filed and available for employee use once they are made available by the chemical manufacturer. 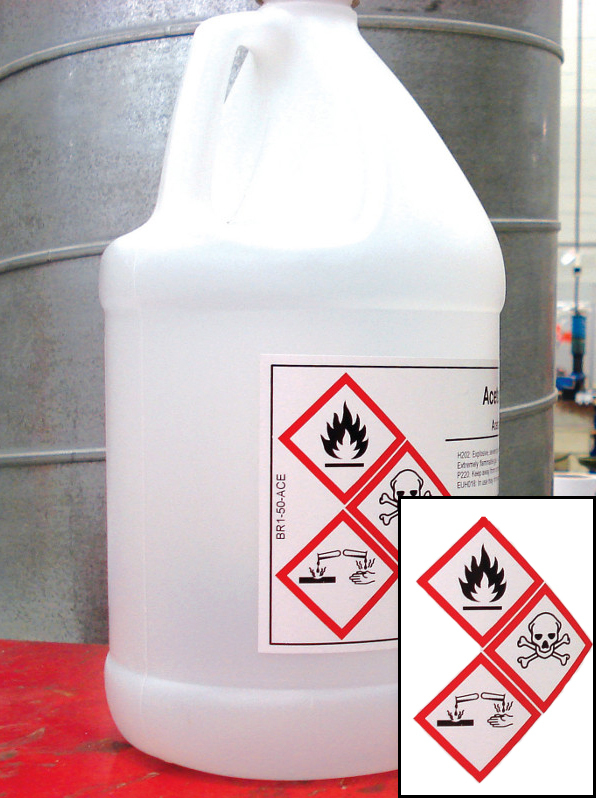 Each primary container's chemical label must appear in the GHS format. This new format will still include the chemical name and manufacturer information, but also requires four new elements: a signal word, hazard pictograms, hazardous statements, and precautionary statements. 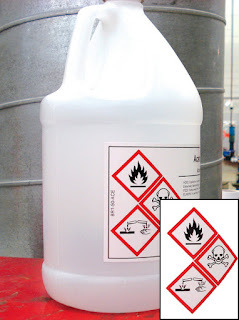 Secondary containers still need to be labeled per the employer’s hazard communication plan, with the label identifying the hazardous chemical and its appropriate hazard warnings (words, pictures, symbols or a combination). Secondary container labels need to provide employees with the specific information regarding the physical and health hazards. Due to the significant changes taking place, it is crucial that employees are fully trained on the changes made and how to read and identify chemical labels and hazard information. There is an initial training requirement for employees. 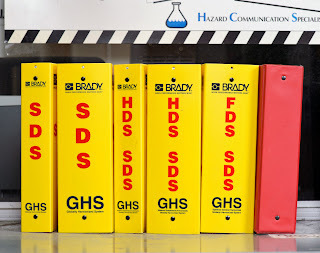 This training needs to cover the changes to the chemical label and SDS formats, understanding of new headings and the sequence of the SDS information, and an understanding of the standardized label elements (which includes the pictograms, signal words, and hazard and precautionary statements). Even common worksite chemicals like Benzene, Toluene, or Xylene will have different information displayed on its chemical label and SDS than what employees are currently used to seeing. OSHA's requirement for annual training on hazard communication has not changed and is still included in the changes to the regulation. As hazard communication continues to be one of the top cited OSHA regulations, it is essential to ensure staff and facilities are completely up-to-date with the changes in the regulation and the effect it will have on the workplace. With the significant change made to the 29 CFR 1910.1200 regulation, OSHA has also provided deadlines for mandatory implementation dates. December 1, 2013: By this date, every single US employee covered under the regulation needs to be initially trained on the changes to the regulation, specifically covering the overview of the changes to the regulation, the changes to SDS, and the changes to the hazard chemical label (focusing on understanding of the pictograms, signal word, hazard statements and precautionary statements). June 1, 2015: All chemical manufacturers need to have re-classified their chemicals, updated the chemical label formats to the GHS format, and updated the chemical's SDS. December 2015: All chemical distributors need to ensure that any product they are distributing has all of the updated information. June 1, 2016: The final date for full compliance. Q Source would like to thank our guest blogger, Danielle Gallo, from Brady Corporation. Thank you very much for your contribution to The Q Source Resource. To learn more about Brady labeling solutions for GHS compliance, please contact Q Source at 800-966-6020 or via email. If there's a product or topic you'd like to see The Q Source Resource write about please let us know. We'd also appreciate if you share, tweet, etc. this blog post with your friends and colleagues via the social media links below. And, as always, feel free to leave us a message in the comments section.